Grace Coconut Water offers great taste for anyone who is thirsty and tired. Drinking this coconut water is a fun and sweet way to stay and get hydrated. If you’re not the biggest fan of all-natural coconut waters, you may enjoy this one – there is some sugar added that makes it most delicious (but does add some empty calories). Grace Coconut Water is perfect for long drives as well as those sweltering summer days. It is also perfect for summer days in the office; a drink of this tropical flavored water will instantly bring you to the white sands and swaying palm trees in the beach. In fact, many hotels and resorts even use this as a welcome drink to their guests. Grace Foods is the manufacturer of many Caribbean foods and their products include this amazing coconut water. This company has been giving people many delightful treats since 1922. Now, they expanded their market and their products can now be seen at different stores in USA, UK and Canada. Grace foods made this delectable drink to satisfy the people’s craving for the tropics. Aside from this, it is also made to offer great nutrition and some health benefits. Grace Coconut Water is the perfect rehydration drink. It is best in humid weathers like summer. Since it is derived from coconut, Grace Coconut Water also gives people the health benefits that you can get from a coconut. For instance, coconut water is known to be useful in dissolving kidney stones. This is why many people drink Grace Coconut water as a precaution. It is also fortified with lots of vitamins and minerals; it is even more nutritious than the regular water. In fact, it offers fifteen times more potassium than any other energy drinks (or a banana) can give you, which will help lower blood pressure and keep you feeling energetic. Grace Coconut Water is imported from Thailand. There are actually has two kinds: plain/filtered coconut water and pulp-based coconut water. These have the same nutrients and benefits; the only difference is that the pulpy one has real coconut bits. This is one differentiator Grace has in the coconut water market. The pulp actually adds some “oomph” making this already-delectable treat even more delicious. You should shake first this drink so that the coco bits will not settle on the bottom of the can. 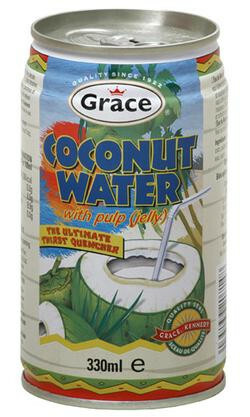 Grace’s pulpy coconut water is a combination of 85% young coconut juice pulp, water and sugar. When you think of Grace Coconut water, don’t expect it to look anything like a coconut juice. It actually looks like cloudy water with white coco bits. It actually doesn’t look very appealing but once you get to taste it, you will surely love it. The only downside to this drink is that it contains sugar. This should not be taken in excess by diabetics. You should also take extra care in letting children drink this because it might not be so good to their teeth. You will never have problems looking for Grace coconut water. Online stores such as Amazon offer it at great prices, as you can see from the price comparison widgets here. Overall, our Grace Coconut Review is very positive if you don’t mind the sugar and drink it early in the day. We have received many wonderful feedbacks from customers both with its nutritional value and taste. In some posts, some customers are really satisfied with the benefits that they get from this coconut water that they even recommend it to others. From what I’m reading, added sugar and water..it’s soda without the fizz. Grace Coconut Water is also offered with the no sugar added option. All Coconut water is excellent for Hydration not Dehydration. What you are saying in the article is misleading that this coconut water dehydrates! Whoa, thanks for catching a horrible typo there!